Players are also asked to play plastic bags. The composer can supply these or the detail is located in the score performance note. Composed for the 2018 Auckland Philharmonia Orchestra ‘Our Voice’ workshop. 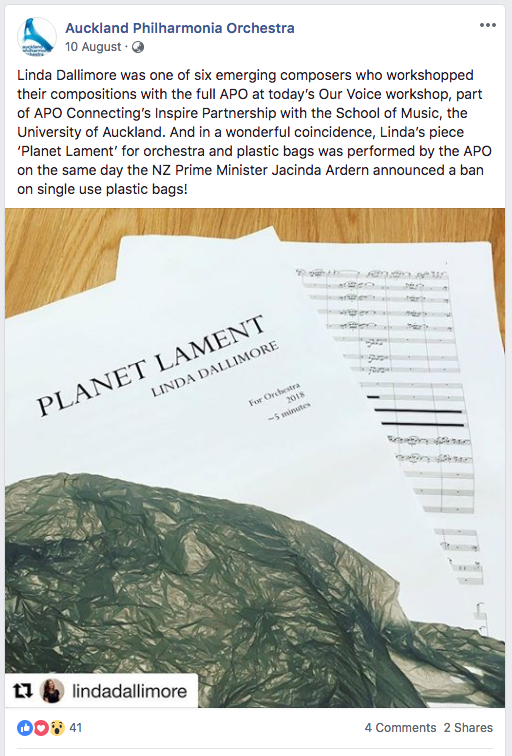 In Planet Lament, the composer provides a musical commentary on the effects of consumerism on our planet. If we all treated our planet with tenderness, as a mother or father might treat a newborn, for example, there would be a dramatic reduction in the consumption of items such as plastic bags. Perhaps it is a seemingly trivial example; but the aggregate impact over time is not. This work is intended both as a lament of our current state, and a visualization of how collectively regretful we might feel in the future, when the impacts of climate change become personal and severe.